ROCHESTER, NY — Special Olympics New York President and CEO Stacey Hengsterman and The Perfect Granola Founder Michele Liddle today announced a partnership to promote athlete health in the Greater Rochester area. 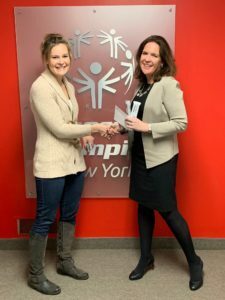 As part of its official sponsorship for the Special Olympics New York Winter Games, which will be held in Rochester Feb. 22-23, the company will provide 2,000 of its signature gluten-free granola bars to athletes. The bars will be handed out as athletes finish their competitions – encouragement to refuel after burning their energy on the ski slopes, skating rinks, or floor hockey courts. The Perfect Granola began in Michele’s family kitchen as a way to feed the hungry, preparing food that could be given away to help those in need while also empowering the underserved. Today, The Perfect Granola gives thousands of pounds of food and support to hundreds of organizations. Its products are pure and simple and don’t just feed your body, but nourish your soul. To learn more, visit www.theperfectgranola.com.